This charming over-stuffed Christmas stocking is ideal as a tree ornament, wall decoration or added to a DIY wreath. Just enlarge or reduce the size of the pattern, and you'll be creating memorable holiday craft decorations in no time. Choose your own color palette to coordinate with your decorating theme, or use traditional colors that make these stockings perfect as Christmas gifts. For added 3-D textures, use real rickrack to accent the gingerbread man and fleece or fake fur fabric for the stocking trim. Just use household glue to adhere your embellishments to your painted piece. 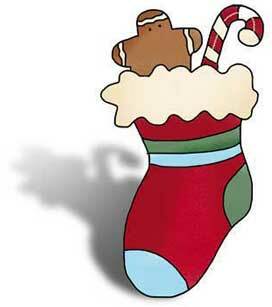 Click here to print the full color stocking. Cut pattern from 1/2" plywood if you are making a stuffed stocking that will hang or will be attached to a wreath. The gingerbread dude and candy cane are also offered as separate pieces in the pattern, in case you want to make them out of fabric (stuffed maybe?) or out of another craft material, and then add them to the stocking. Use real rick-rac for the gingerbread man and a fleece fabric for the top of the stocking. The toe, heel and stipes of the stocking could also be cut from fabric such as fleece, and glued on. Add a child's name in the stocking stripes for personalization. If hanging, when finished drill a hole in the top of the gingerbread head and the top of the candy cane. String the wire through both holes as a handle and hanging tool.